Banyan Tree Bintan offers luxurious Balinese-style villas with a private spa pool and free Wi-Fi, steps from a private beachfront. This peaceful resort boasts a world-class spa and an outdoor pool. Enjoying views of the South China Sea from a private terrace, villas are equipped with a flat-screen cable TV and a DVD player. Each is well-equipped with a comfortable seating area and tea/coffee making facilities. Banyan Tree Spa offers a range of relaxing massage and body treatments. Guests can also enjoy the use of tennis courts and the nearby 18-hole Laguna Bintan golf course. Other activities include cycling, canoeing and hiking. The main Saffron Restaurant offers Thai and Indonesian favourites with Asian-themed cocktails. 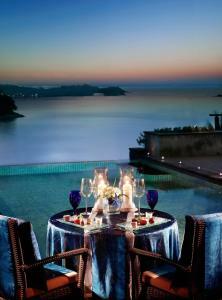 Guests also have the option of in-villa and beachfront dining. 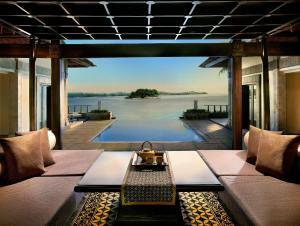 Banyan Tree Bintan is a 45-minute ferry ride from Singapore.